Moderator Kim Severson and panelists José Andrés, Danny Meyer and Aaron Silverman discuss the restaurant industry Thursday night in the Jack Morton Auditorium. Three world-renowned chefs and restaurateurs served up insight on the changing restaurant industry Thursday night in the Jack Morton Auditorium. 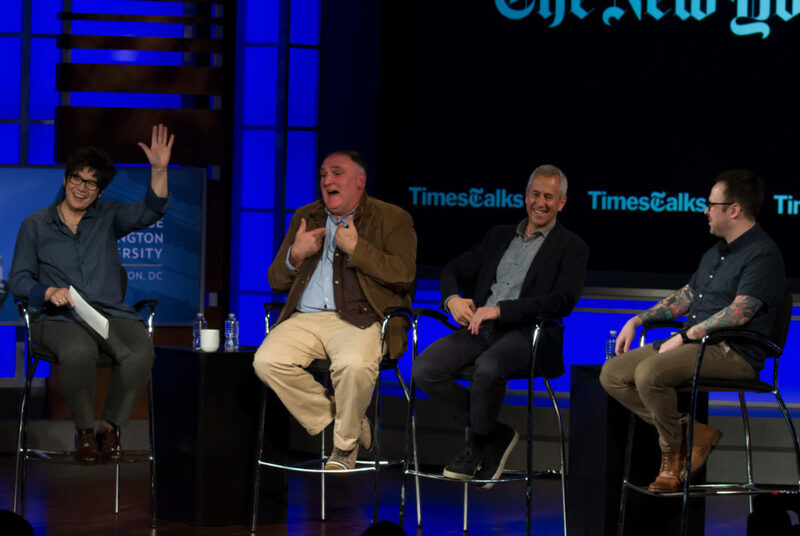 The event, hosted by the New York Times called The Future of Restaurants, featured a panel with José Andrés, Danny Meyer and Aaron Silverman discussing a range of topics, from the #MeToo movement’s impact on the restaurant industry to their experiences cooking for former presidents. The conversation was moderated by New York Times national food correspondent Kim Severson. The chefs and restaurateurs were not only linked by their impressive culinary achievements, but also their shared commitment to humanitarian ideals and projects. All three have worked to combat hunger across America over the past year, and they said it is critical that chefs use their rising visibility to advance important causes. The evening began on a somber note with a discussion of the #MeToo movement and its impact across a gamut of sectors – including the restaurant industry. The chefs discussed how the movement has affected people in every industry in America, including at restaurants with everyone from waitresses to head chefs. Although sexual harassment is an issue that many fields face, Andrés said it’s important for each group to confront it head on. Andrés added that women are responsible for feeding and maintaining the human species, addressing the fact that they often don’t get as much credit as the men who have traditionally dominated leadership roles in kitchens across the world. All three chefs shared Andrés’ commitment to confronting violations of women’s rights and representation across all industries. From eliminating tipping and reservations to recruiting employees from new and unconventional places, all of the panelists are challenging the status quo of restaurant management in unique ways. Meyer, the restaurateur who founded the Shake Shack empire, has recently launched a no-tipping policy in which the service fee is included in the tip. The idea, which has been met with both praise and controversy, follows his philosophy that employees should be rewarded for their work with better, more equitable pay. Additionally, he said he has been relying less on looking for employees in spaces with traditional recruitment – like colleges and culinary institutes – and more on older people, former prisoners and anyone with a passion for hospitality. Silverman, the chef behind two top D.C. restaurants – Rose’s Luxury and Pineapple and Pearls, has launched a no-reservation policy in his Capitol Hill restaurant, with the exception of large groups. The idea behind the policy is to allow all patrons to feel at ease and not rushed to finish their meal. He said this policy has created a more welcoming and open ambiance that extends to the surrounding neighborhood. All three chefs and restaurateurs have been known for changing the dining scene around D.C.
Meyer said his biggest career moment came when he had to ensure that he perfectly prepared steak for then-President Barack Obama and First Lady Michelle Obama. Only a few hours after he was told by the White House head chef that he had an hour to get the meal to the Obama’s, Meyer found himself lodged under the arm of very satisfied commander in chief, who was publicly congratulating him to the awe of the other restaurant-goers. Aside from the sporadic opportunities to cook for leading political figures and foreign dignitaries, the three panelists spoke to other exciting elements of the D.C. food scene, namely the rise of ethnic cuisine and many opportunities for innovation in the food industry.